First, happy birthday to all of you turning 65 in 2015. This is not just another birthday for you. 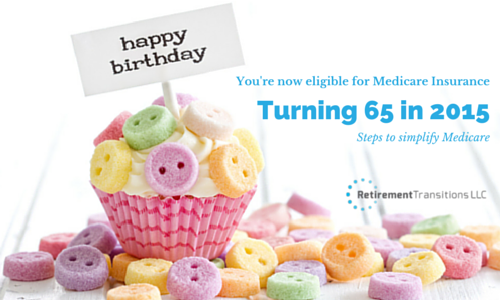 Turning 65 is a very important birthday because you are now eligible for Medicare. There is going to be a lot of information thrown at you. Follow these basic steps to elect your Medicare insurance, find Medigap plans available in your area, and how to apply for coverage. Three months before your 65th birthday you can elect your Medicare Part A and Part B benefits. You have options on how to apply for Part A and Part B insurance benefits. Call your local Social Security office. The Social Security office, not Medicare, handles electing your Medicare benefits. After speaking with Social Security, they will mail you the forms that need to be completed and returned. Make an appointment at your local Social Security office. Apply for Medicare Benefits online by clicking this link. It is up to you as to which one of these options is the most convenient. Your Medicare benefits will start the first day of your birthday month. For example, if you turn 65 on June 15, your Medicare insurance will start June 1, 2015. Learn more about Medicare Part A and/or Medicare Part B. The next step in electing your health insurance benefits when new to Medicare is finding supplemental coverage. Supplemental coverage is also referred to as Medigap Insurance. There are multiple Medigap insurance companies who offer supplemental plans. Medigap plans supplement Medicare by helping cover deductibles, co-pays, and coinsurance. Since supplemental plans by law have to have the same cover, no matter which company you apply with, we suggest comparing top companies with the lowest premiums. This sounds very time consuming, but it’s not. Simply click this button and you will find quotes from top supplemental companies in your area.